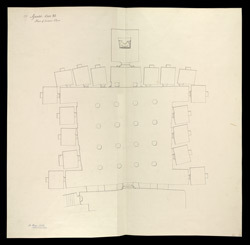 Plan of the lower floor at Cave VI at Ajanta from James Burgess' 'Original Drawings from the Buddhist Rock Temples at Ajanta.' The Buddhist cave temples of Ajanta were excavated into a horse-shoe shaped cliff overlooking the Waghora River in the 2nd ? 1st century BC and later in the 5th century AD, a period of time which coincides with the Hinayana and Mahayana phases of Buddhist art. Cave VI is a monastery from the late 5th century which was excavated on two levels. The verandah has fallen away. The lower hall has sixteen octagonal columns arranged in four rows. A flight of steps leads to the upper level where there are Buddha figures in the verandah shrines.